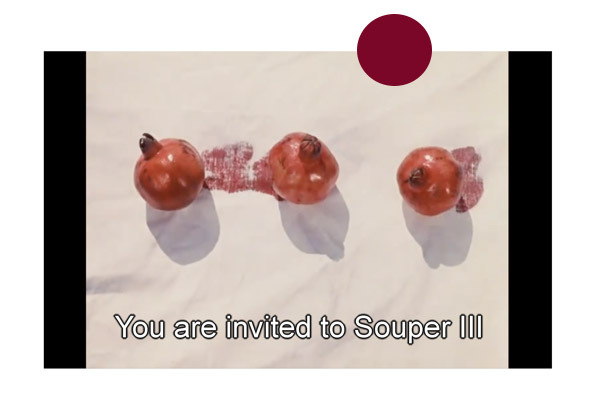 TAFEL invites you to SOUPER III, a diner performance in eight courses. As usual TAFEL questions the relation between word and thing – what you see isn’t always what you get. The third edition is one of a surrealist mind and follows the rhythm of the dreamlike movie The Color of Pomegranates (Sergei Parajanov, 1968). This is an attempt to expand the moving image into taste and aroma and therefore a lucidity of all senses. How will vision, sound and movement influence and mislead the flavors of our menu? In a set space and time, you’ll float through the orchestrated menu from dawn till dusk, from youth to matured. Please pick a date and reserve your seat at our table, limited access!